PAUL JAY, SENIOR EDITOR, TRNN: Welcome to The Real News Network. I’m Paul Jay in Washington. On Wednesday, 17 US senators called for a crackdown of regulatory authority on oil speculators, saying that speculation is driving up oil prices while supply and demand simply don’t justify the current price of gas. Now joining us is the McClatchy newspaper chain national economics correspondent, Kevin Hall, who’s been working on this story. So what have you found? Supply and demand versus speculation. KEVIN HALL, NAT’L ECONOMICS CORRESPONDENT, MCCLATCHY: Well, it’s pretty clear that there’s been a divorce between the actual supply and demand fundamentals and what’s going on in the speculative markets. There’s a huge inflow of money, speculative money. It used to be, historically, that 30 percent of the market was speculators. They provided what’s called liquidity, a kind of grease, to find someone on the other end to hedge a bet. When you’re–what they’re trying to do is guard against fluctuations in price–the airlines, trucking companies, railroads. Today, that’s reversed. Today, 70 percent of the market is speculators and 30 percent are end-users. And you have also had a huge accumulation of what are called paper barrels, that there’s trading, you know, exponentially the difference between actual barrels and paper barrels. And it seems pretty evident to quite a few economists that there is more than just supply and demand fundamentals going on, but we haven’t been able to attack that from a government standpoint. JAY: Now, the speculators, they say, well, you know, we may bet long, but someone else has to take our bet and bet short, so we’re really just betting against each other. What’s that got to do with the price of oil? HALL: Well, I think that’s the fundamental question. In academic circles, some people will argue that, well, whether you have 10 million contracts or 100 million contracts, it’s the same at the end of the day: you’re finding a price between a buyer and a seller. But when you have so few barrels of oil taking delivery, it seems pretty clear to a lot of people that this is having an upward movement on prices–kind of a self-fulfilling prophecy. People are playing the commodities markets as if they’re in a stock market. A stock market, you’re making a bet on a company that you think is going to grow. In commodities, the futures market is designed to hedge against price fluctuations, and instead what’s happening is people are taking long positions, a large amount of money coming in, and saying, I think oil’s going to go up in price further down the road. So we drop down, we pick back up. But it’s kind of a long upward climb. What’s happened in the last week and a half or so, we had a $15 swing in price in one week at a point when US crude stocks and inventories were at six months highs. And then you had a $5–coupled with a $5 increase, now another $5 decrease. You have this massive volatility. And there’s ample evidence that we have plenty of supplies. There are no shortages. There’s excess production capacity around the world, and demand around the world is really weak. So it doesn’t add up to why we’re having all this price volatility. JAY: Now, what about the argument that China and India are buying up so much more oil that that’s driving up the prices? HALL: Well, it would be the tail wagging the dog. In many ways, they are big new consumers of oil, but their percentages compared to the United States and Europe are much smaller, and the US continues to consume roughly a quarter of the world’s oil. We produce half of our own oil. The other 41 percent we get from Mexico, Canada, and Venezuela. So you can see that we don’t have supply problems in the United States. Now, it’s a globally set price traded on the futures markets, but I think you can make a strong argument that we’re not anywhere near having oil shortages, and in fact for the first time in quite some time, for two consecutive years, the United States has increased production. JAY: So what are the senators calling for? What kind of regulation are they talking about? And who would do it, and how? HALL: Well, last year’s financial regulation, the Dodd-Frank act, in shorthand, gave the Commodity Futures Trading Commission powers to impose what are called position limits–you know, big players cannot take more than x percent of the market. The proposal on January 26 that came out from the CFTC was a 10 percent cap. So no big trader–a Goldman or a JPMorgan or [incompr.] big guys–couldn’t hold more than 10 percent of all the positions in the market, either long or short. What has happened from that day forward, a lot of people–a lot of the people that want it tougher wanted a return to that 70:30 mix that had been most of our history. JAY: Just remind us again. HALL: Right. The 70 percent end-users, 30 percent speculators, something in that level. Instead, if you can only–if any one person cannot control more than 10 percent, that really doesn’t get at the heart of speculative versus non-speculative. So I think from that day forward, you can track price increases in oil. And I think a lot of people think that the market took that as a signal, hey, this is a green light, we’re not going to get hammered. JAY: Now, there’s a fight going on about exactly how regulation is going to be executed under Dodd-Frank. There’s a lot of arguments about the actual language. I mean, part of Dodd-Frank is it has a provision that they’re supposed to regulate in the interests of the stability of the economy as a whole. And that provision doesn’t have any meat on the bones. But is that where the senators are trying to get people to use that to try to exercise some authority over this? HALL: Well, there are two things going on. One, they’re trying to get the CFTC to actually really start enforcing and looking at these things. But something else has happened in the meantime: we’ve had the budget fights, and the CFTC has not received the funding it was supposed to get under the Dodd-Frank bill to carry out all these new mandates. They’re struggling to meet all these new regulatory proposal requirements. And Wall Street is lobbying very heavily, both on the Hill and at the agency, to postpone a lot of these changes. You know, there’s a complex derivatives market that had never been regulated. That would come under–so–and in this derivatives market, oil contracts, beyond the futures contracts, where people are betting on the future, which way the price of oil might go, in what’s called the over-the-counter market, which is trillions of dollars, these folks are betting two–you know, two companies privately bet on oil. And then, historically, Wall Street firms have then been able to hedge whatever bet they made privately in the oil markets. So nobody’s looked at this, you know, for the longest time. Dodd-Frank gives powers to start regulating this, and Wall Street is pushing for an 18-month delay in implementation. Where does 18 months take us? After the next presidential election. And they’re betting that they’ll get a–they’re hoping that they’ll get more favorable treatment in 18 months. 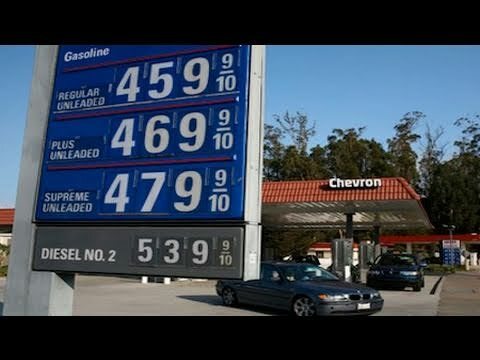 JAY: So if people are interested in trying to drive down the price of gas at the pump, they need to pay some attention to whether this regulation’s actually going to be serious or not. HALL: I think you see a lot of proposals on both sides, Democrats saying tax the oil companies, Republicans saying we have to drill more oil, we have plenty of oil. It’s pretty clear where the problem is. JAY: Yeah, speculation. Thanks for joining us.